Like the Lambo, the driver is light and fast. 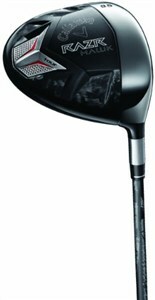 The stock shaft in the Tour driver is a 45.5-inch Aldila RIP graphite shaft, and the head is a workable 445cc. Thus, you can draw and fade the club at will. Hence the name "RAZR" as you can carve the ball any way you want. Overall, the feel is solid with a muffled sound. No loud "tink" here. Even with the feather-light weight, the club still feels sturdy in your hands. The trajectory is easy to control, and mis-hits still fly far. Of course, you don't see any of this at address, and it doesn't seem to bother Mickelson and Quiros.